This week I was visiting family in Philadelphia and being the history nut that I am I decided to take a day to see the sights. Unfortunately the Independence Mall area was flooded with kids on end-of-year class trips so I avoided that part of town. Luckily (for me) the Independence Seaport Museum area was virtually empty. Deserted is a better term. While I’m concerned about the lack of attention this great Philly museum complex gets, for guys like me who like their museum experiences sans hyperactive grade schoolers it was a great day to visit the place. The Independence Seaport Museum celebrates Philadelphia’s history as a major seaport. From the city’s founding in 1682 right up through WWII the city was one of America’s major seaports, and at times handily out ranked New York and Boston as the #1 seaport in the nation. The city has also had a large Italian population, and South Philly has long been known as a center of Italian-American culture. I believe it was the Italians in Philly that gave us one of the greatest culinary masterpieces of all time – the Philly cheesesteak sandwich (made, as God intended, with provolone cheese, not that hideous Cheese-Whiz that’s become so popular). In 1992 the Italian community in Philadelphia decided to celebrate their heritage and the 500th anniversary of the discovery of the Americas by honoring a favorite Son of Italy, Christoper Columbus. Just ignore the fact that Columbus wasn’t Italian, he was Genoese; Italy as a nation didn’t exist until the late 19th century and Columbus would have never considered himself Italian. In fact if you called him Italian to his face he probably would have had no idea what you were referring to. Or he’d have taken it as an insult. 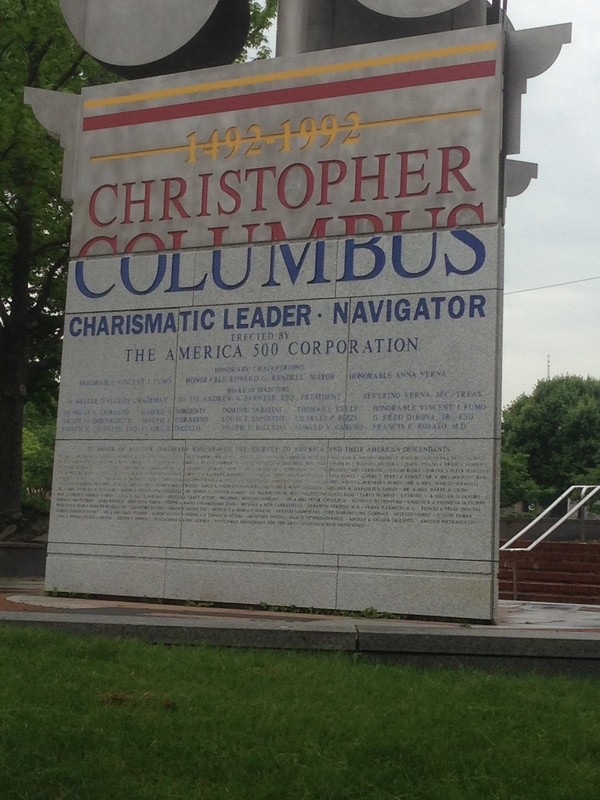 As part of the celebration the Italian community had a memorial erected on the grounds of the Independence Seaport Museum commemorating Columbus and his achievements. The memorial is an impressive three-sided tower, the base of which is sheathed in granite plaques that list Columbus’ achievements along with the list of prominent contributors to the memorial. The list of contributors looks like it was taken straight out of a phone book from southern Italy, with one key exception – a guy by the name of Ed Rendell. But hey it’s Philly, where anyone can be made an honorary Italian. The list of Columbus’ achievements looks good. Christoper Columbus the Charismatic Leader and Navigator. 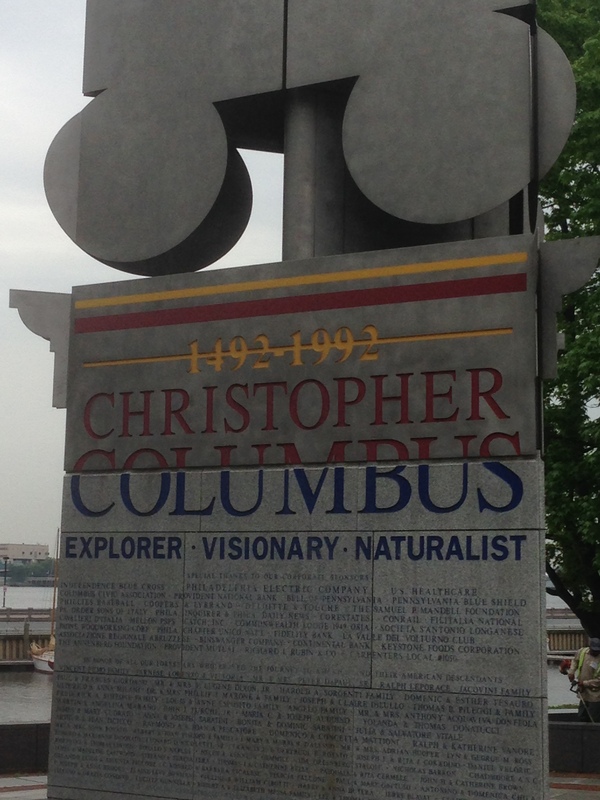 Christopher Columbus the Explorer, the Visionary, the… Naturalist?! 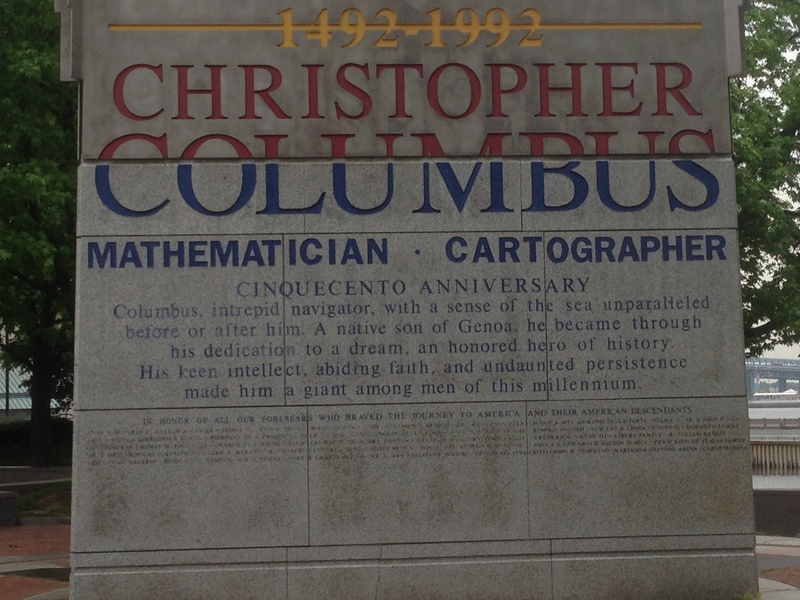 OK, I’m a big fan of Columbus and I pretty much agree he was a great visionary, explorer, cartographer, mathematician and leader, but it’s a real stretch to label him a naturalist. Sure Columbus dragged a few plants back to Spain with him to show off to Their Catholic Majesties, Ferdinand and Isabella. But trust me, he was only bringing back plants he thought he could make a buck off of. If Christoper Columbus was a naturalist then I’m Frank Sinatra. This entry was posted in History and tagged columbus, philadelphia, philly by Brian Haren. Bookmark the permalink.